We have always known that the Lord would call us to adopt one day. He has used many special people and circumstances to lead us in this decision. We know first and foremost that we are called to care for orphans, therefore, out of obedience we answered this call to pursue adoption. China has always held a piece of our heart for many years because of the great number of children needing homes in Chinese orphanages. On July 13, 2015 we met Amanda at New Beginnings and began this long crazy process. We cannot express what a blessing New Beginnings has been to us over this past year. Their love for these kids and their Christian foundation is why we chose to pursue adoption through them. They have gone above and beyond to make sure we were taken care of from the first meeting in their office to our days in China to now as we follow up with post adoption paperwork. We are so thankful to Amanda for holding our hand through this process. Our travel to China was so smooth despite our fears and concerns about what this process looked like. Amanda had our trip laid out in perfect detail and all we had to do was sit back and enjoy the ride. It was suggested that we arrive in China a couple days early and we are thankful we did. We were allowed time to get much needed rest prior to getting Micah. Our guides were exactly where they were supposed to be and were so helpful to us. They made sure we had all we needed and would do whatever it took to make us comfortable. “Gotcha Day” was exactly what we prayed it would be. Micah was well prepared for us and we were for him. It was amazing to see how the Lord was at work throughout this entire process as He was preparing Micah to meet us. The rest of the trip was well planned and everything worked like clockwork. Our main struggles in-country were the language and cultural barriers. Micah took everything with stride thankfully as we worked hard to live these two weeks in his country. After 15 long days of travel and hotel stays we were glad to get home and see our girls, family and friends. 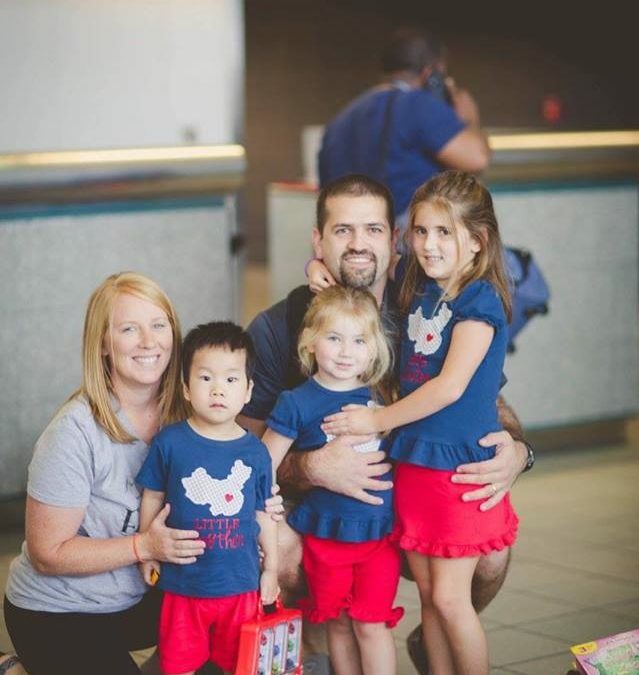 When we walked off the plane and saw our girls they took Micah’s hand and welcomed him into the family. They have loved him so well in so many ways. We were nervous about the adjustment since we have another 3-year-old at home. However, once again the Lord prepared their hearts to love and accept each other perfectly. Micah walked into our home as if he has always been there. Since that first day home there have been obstacles to overcome. Language and fears have been the biggest issues we have had. We have been home 16 weeks and for the majority of the day language is not an issue any longer. Micah is learning English so quickly and is using the sign language we have taught him when he has trouble communicating. He has learned what life looks like for us and has embraced that in every way. His fears have gotten so much better and he has grown to trust us and love us as his family. Micah loves having a family and a home! When we have been away from home for a while he will ask me “wanna go home?” This sweet boy is such a blessing to our family and we are so thankful the Lord has given him to us! In the beginning we thought we knew what adoption looked like. However, looking back to that first meeting day at New Beginnings, we had so much to learn and are different people because of it. We could have missed so much had we not answered this call to adoption. It means so much more each day as we set back and watch the smiles and giggles as Micah runs through the house playing with his sisters and cousins; sleeping cozy and warm in his PJs snuggled up under his covers; crawling into our lap just so he can get a hug and kiss, etc. Adoption is life changing and has definitely changed our life in so many ways and we are so blessed. If you feel the Lord leading you to adopt, say “YES!” and trust Him to take care of every detail! The number of children needing a family is overwhelming and there are so many just like Micah waiting for a forever family that will love them unconditionally. There are so much we could have missed if we had said “no”.